Matter is made out of fermions*. Fermions are made up of quarks and leptons. Atoms are mostly made out of quarks. Quarks live in pairs or triplets, no quark has been found alone or in quartets and above (or as my roller derby brain insists, quad-tet). Lone quarks are theoretically impossible because of quantum chromodynamics. Color is important to quarks… I have no idea what that means or how it relates to normal human colors. Then stuff gets weird! Quarks in pairs are called mesons (and while they’re made out of fermions they’re categorized as bosons because they’re involved in force, not matter, although they are forces that are essential for matter to exist forces are essential, but mesons aren’t part of day to day atomic life. See the comments for more info!). One particle in a meson is a quark, the other particle is an ANTI-QUARK! The meson can still have a positive charge if the quark has a stronger charge than the anti-quark. Forces bind the quark and anti-quark together and then other forces keep them separated so they don’t annihilate each other. To get the charge of the meson particle you simply add the positive and negative charges together. Quarks in triplets are called baryons. Baryons are wot we are made of. When someone says baryonic matter, that’s a fancy way of saying matter that exists somewhere on the periodic table. Baryons can be made of quarks and/or anti-quarks! 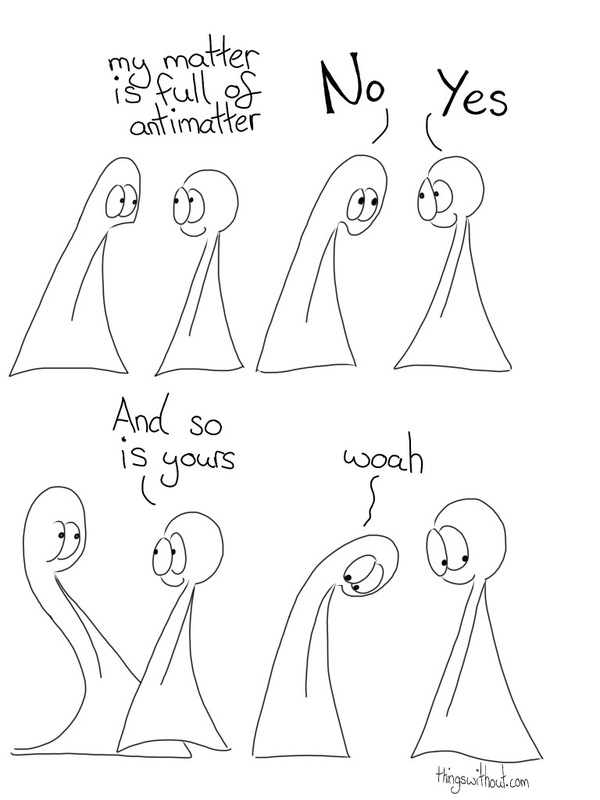 I’ll repeat that in case you didn’t hear QUARKS and/or ANTI-QUARKS living together! A quark’s bffs for life can be anti-quarks, anti-quarks! All of us folks made of matter have anti-particles inside us. We have baryons to give us matter and mesons generate forces that help matter hang out with matter (I think that’s the technical term, mesons are the mediating particle of the Residual Strong Nuclear Force… last I heard it was useful for neutrons and protons to hang out and form that middle bit of an atom). Doh! This is what happens when you learn by piecing stuff together and coming to what feels like a logical conclusion on incomplete information that feels complete because you think you’re finally getting a handle on things. Mesons are all about Residual Strong Nuclear Force, but they are not the only particles playing the nuclear force game. Mesons are rare beasts that live out in space and generate gamma radiation, something that life as we know it does not enjoy. Thanks Vandana Singh, see comments for further info. At our most fundamental level we contain the anti to our matter. That is what allows us to exist. Opposite particles that are so tightly into each other that the force of trying to pull them apart would be so violent it would cause other particles to spoing into existence. Opposite particles that would annihilate each other if they touched. I dunno about you, but that’s pretty amazing. In Saturday’s comic I’ll write about awesome people who have been helping me with my research. I was going to do that today, but I got carried away by the science of it all. * Info for this excited post mostly comes from the Particle Physics Overview, from the Astronomy department at Case Western Reserve University.